BENIDORM (one of the main holiday resorts in Spain), CALPE (the fishing village), VILLAJOYOSA (the chocolate’s town), FINESTRAT (Shopping & panoramic views), DENIA (Gate of Costa Blanca & Balearic Islands), ALTEA (the art & cultural town) and some other beautiful towns in COSTA BLANCA (ALICANTE). STARTING PLACE : – Parking Night BENIDORM PALACE BENIDORM CIRCUS Beside the Club.-. END OF TOUR LOCATION : – The former self. SCHEDULE : – WINTERS: (16 -Oct- to April 30) .- 11.00 hrs and 15.30 hrs. SUMMERS: (May 1 to October 15) .- 10.00 hrs and 17.30 hrs. NIGHT HIGH SEASON (From 15 June to 15 September): 21.30.
WHO I COULD MAKE THIS TOUR? .- People weighing between 38 kg and 120 kg can be mounted on the Segway. Children over 12 years with a minimum weight of 38 kg and people in physical conditions equivalent to cycling. WHAT’S INCLUDED .- Private tour with professional guide-monitor. 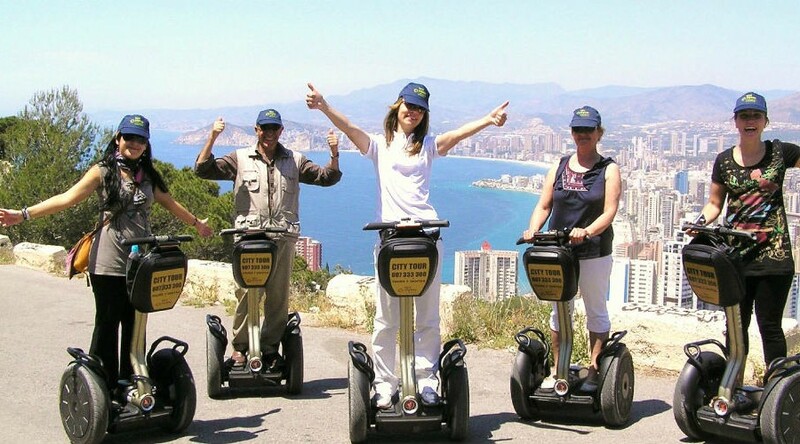 Beginners’ course at Segway. Equipment wireless transmitters Radio-guides with headphones. Insurance. Tickets to some museums. A) city of Benidorm: – Tour of the Rincon de Loix, Promenade Levante Beach. Old Town of Benidorm. Mirador de Benidorm. Aigüera Park. Town hall. Auditoriums. Bullring. B) Natural Park “Sierra FROST” .- tour of the Rincon de Loix. Playa de Levante. Mountain Home ascension Sierra Frost. Tour of the Natural Park. Stunning city views and Costa. Tower from the S. XVII. Remains of Roman mines mineral ocher.